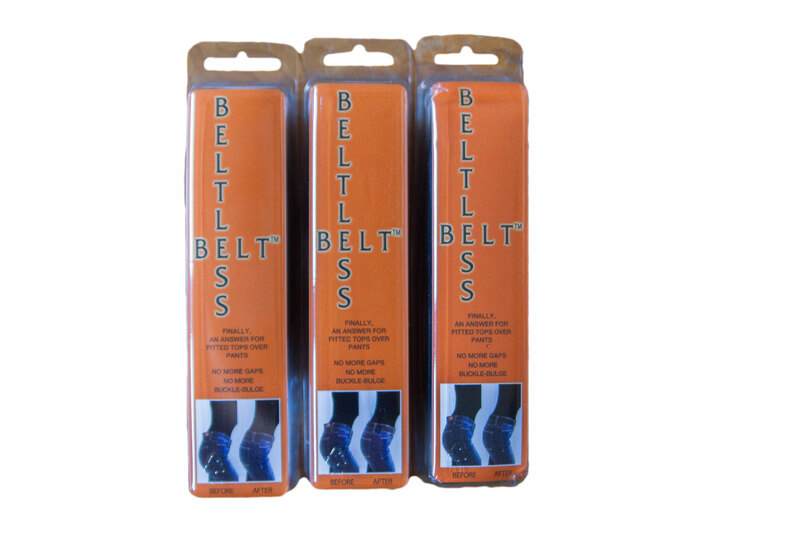 The Beltless Belt was born of necessity. More than one year ago, I was very frustrated because my new jeans fit perfectly except for the waist. A small gap changed the entire way the pants and my outfit looked because the waistline gapped, sagged, or stretched. My research on Google™ for flat, hidden, invisible, and custom belts produced two products I believed to be solutions to my problem. I tried them both, but neither worked as I wanted them to work. The first one wasn’t a belt at all. It was a cinch that grabbed the loops on the back of my jeans, which created a lopsided effect. The concept was good, but not realistic. The second one was a clear plastic belt that seemed like a good idea, but only worked in theory and not in practice. The buckle was difficult to adjust due to the sticky plastic, which was similar to plastic straps on bras. The belt became stickier the hotter it got, especially if it touched my stomach. Even though the buckle was clearly smaller than a regular buckle, it still protruded slightly when I wore a fitted t-shirt. This clear plastic seemed like a great idea because of the versatility, but I didn’t like the look of plastic around my waist if my shirt rode up. After these products failed, I went to my local craft store to make my own belt. I purchased elastic and some Velcro™, because I thought this would give me the stretch I needed along with the flatness I wanted. Although this worked for a while, it still wasn’t good enough. I was then introduced to a unique fabric that was perfect for what I wanted to do. It gave me the elasticity, lightness, and flatness I needed, as well as the strength, durability, and comfort I wanted. 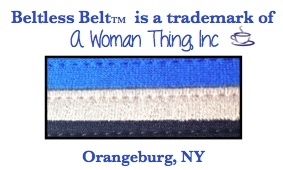 I simply added high-grip Velcro, custom stitching and the Beltless Belt was born. I was so convinced of its usefulness that I applied for a patent.